So I am on this trip of trying out E.L.F. products along with using my daily higher end products as well. Kind of like mixing Couture and Target in fashion..lol I just saw on their website that they are launching 2 new LE Eyeshadow Palettes. One that contains 32 eye shadows for $5.00 and the other that contains 100 eye shadows for $15.00. I think these are both great deals and will make great holiday presents. 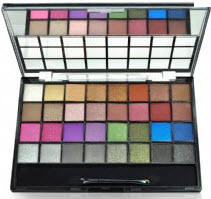 I am very eager to try them out but I think I will start small with the 32 eye shadow palette. I mean for $5 I don't think you can go wrong. That is cheaper then a sandwich for lunch:) They also include a double sided mirror along with an eye shadow applicator. 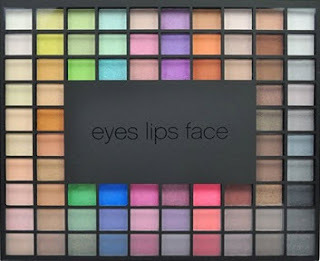 Below are the pictures of the two different palettes. Which one do you think you will try? Loads of pretty colors in each one. I can't wait to try, swatch, and review.